Dave Richeson, who writes the Division by Zero blog is an Associate Professor of Mathematics at Dickinson College and also the author of a really good math book, " Euler's Gem: The polyhedron formula and the birth of topology" from Princeton University Press. He also just introduced me to a word I didn't know, potamology, from the Greek ποταμός, river. The word is the technical name for the study of Rivers. Incredibly, there is some really cool math and statistics involved in the study of rivers. For one thing, they are sort of fractal, or as Dave explained it, " the size of a river cannot be determined by its shape on a map. In particular, if you looked at an aerial snapshot of a meandering river, you would not be able to tell whether it is the Amazon or a small neighborhood stream!" Dave goes on to relate how a the distance between two meanders in a river are related to its width. If we let the width be w, and lamda be the distance between the beginning and ending of one not-quite-sinusoidal period of the meander, then lamda = 11w. For stats kids, he also posts a regression plot of the actual ratio between meander length and channel width....stats in action baby. Go to Dave's site and read the whole thing.... he has cool pictures for examples also, including the one above. It is a simple geometry question... if you hold the perimeter of a convex polynomial constant, what are the possible limits on the sum of the diagonals, in particular, what is the maximum. I realized I was pretty unsure about the solution, even for a quadrilateral, the simplest case. I thought about a rectangle, and realized that the diagonals get longer as the sides become less equal. If we assume the perimeter is p, then any two sides of the rectangle would be x, and p/x-2. The two equal diagonals would each be the square root of (x^2 + (p/2 -x)^2)) which is largest when the sum of the squares is largest. But the sum is 2x^2 - px + p^2/4 . This is a positive quadratic, and so it is greatest at the ends of its domain, and smallest at the vertex (p/4)... a square has the smallest sum of the diagonals of any rectangle. This is easy to confirm if you take a 4x4 square which has two diagonals of 4 sqrt(2) for a total of 8 sqrt(2) (more or less 11.314), but if we put make it more oblong, say a 7x1 rectangle, the diagonals are each sqrt(50) or 5 sqrt(2) for a total of 10 sqrt(2) (a larger 14.142)... if we extend this to the limiting behavior, we see that each of the diagonals would be close to p/2 so the total sum of the diagonals would approach the perimeter as a limit.. Trying different shapes led me to think (but not prove) that p is probably the limit for a quadrilateral. But what happens if we let the number of sides go beyond four.... I had no idea how to approach the problems except to experiment. I began by drawing five points on a circle and taking the ratio of the sum of the diagonals to the perimeter. I quickly realized that if I moved two of the points close together on one place and three others near the opposite side of the circle the ratio approached two.. the diagonals were nearly twice the perimeter. 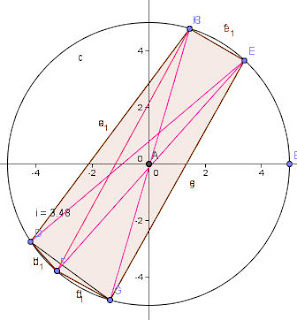 This made sense, three of the edges would be nearly zero, and two would be almost the length of the diagonal of the circle, so the total perimeter would approach 2d. And what of the diagonals? Well, there would be four diagonals that went from the two points on one side to the opposite three points that would each be approximately the length of the diagonal, for a total of 4d. Hmmmmm could I see a pattern here? for n=4, the ratio of diagonals to perimeter was 1, for n=5 sides, the ratio was 2, and at n=6 the sum would be 3.5. Well, for a four sided figure, there were two diagonals (and essentially all the perimeter was in two sides, 2/2 =1 ) . For a pentagon, there were 5 diagonals, but one of them went to essentially zero... the ratio was 4/2 or 2. With a hexagon there were 9 -2 long diagonals, so a ratio of 7/2. Could I extend this? and it is late, so I will let you write the explicit function...I'm just thankful that the holiday is at hand. I'm off to London with my sweetheart for the weekend to see a west-end show and have a good Japanese meal... and hold hands and walk through the neighborhood markets... hope you have a great holiday too. I was in Cambridge recently with my beautiful sweetheart, and we were browsing through Oxfam when I came across the book, Foolish Words, The most stupid words ever spoken by Laura Ward. It is gut wrenchingly funny in places (and also terribly sad at the same time), but I especially treasured some of the bold predictions about the future from people who would be expected to have a better than average insight into the topic. It reminds me of the wisdom of a quote on my classroom wall, "Never miss a good opportunity to shut-up." "The energy produced by the breaking down of the atom is a very poor kind of thing. Anyone who looks for a source of power in the transformation of the atom is talking moonshine." Einstein had said only a year earlier, "There is not the slightest indication that atomic energy will ever be attainable. It would mean that the atom would have to be shattered at will." Thomas Edison in 1928, "I have determined that there is no market for talking pictures." German Physicist/chemist Johann Poggendorf proudly announced, "It is impossible to transmit speech electrically, the 'telephone' is as mythical as the unicorn." Lord Kelvin, President of the Royal Society, and so esteemed that he was buried in Westminster Abbey next to Isaac Newton, said, "X-rays will prove to be a hoax" and is also known to have said, "Heavier-than-air flying machines are impossible" in 1895. Then he went on to doom another budding invention, "Radio has no future." Perhaps he had anticipated the birth of television. Lee DeForest was an inventor whose work ushered in the electronic age. The inventor of the tube which made audio amplification possible and bringing sound to the motion picture went on to proclaim, "While theoretically and technically television my be possible, commercially and financially it is an impossibility." Finally, a quote from Dr. William Clark, president of the Arthritis Foundation in 1966, "We just won't have arthritis in the year 2000." (I have it on good authority from my aching shoulder that it is back by 2009). I guess I leave the last word to that Great Statesman, George Bush, who explained it all as an educational problem when he stated in 2000, "What's not fine is, rarely is the question asked: Is our children learning?". Ok, observation number one, Joe S picked up on this one right away... Every odd powered PWEC will have a zero at x=-1... easy to confirm because the alternating powers will be negative and positive. Descarte's rule of signs proves that there can be no real zeros that are positive. My experience is that it always has just one; the one at x=-1. This time you can't get much from Descarte, but it seems from observation that an even PWEC can never have a zero. I played with this a little and haven't succeeded in proving it analytically for anything but a few simple polynomials.. any offers? OK, no easy stuff on this one... what do you think? This time there are no tricks with the zeros... Ok, maybe one more.... notice that the horizontal tangent occurs with x>0...but that is a no-no as well. The derivative will also have all positive coefficients, so by Descarte's rule of signs again, it can not have a zero when x>0. I admit I had never thought of any of these things, and noticed them all by working with interactive graphs on Geogebra.. one reason I am thankful for the power of modern computing... I know more math because of the technology available.. and I want my kids to see that it can be more than an easy way to get the answer, it can help you learn more about the ideas of mathematics. I mentioned in my last blog that I had been exploring the relationships around the problem of a common tangent to a circle and a parabola with a vertex at the center of the circle. To make notation easier, I have assumed that the center and vertex are at the origin and the axis of symmetry is along the x-axis. I came across a couple of unexpected (to me) relationships, and so I thought I would present them in the form of a problem, with the answer further below. If I understand the relationship (no guarantees) then there is a unique solution to each point. 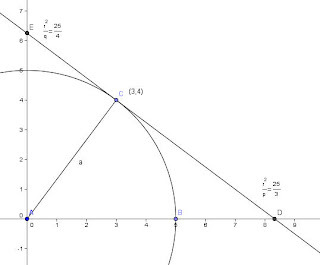 Problem: A circle centered at the origin with a radius of r shares common tangents with a parabola y2 = ax. If the tangent contains the point (p,q) on the circle; find the coordinates of the tangent point (s,t) on the parabola? c) the x-intercept of the common tangent is the negative of the x-coordinate of the tangent point on the parabola. The x- intercept of the tangent line is at -25/3, so the value of the x-coordinate of the tangent point on the parabola is at 25/3. The y-intercept of the tangent line is at 25/4, and so the y-coordinate of the tangent point on the parabola is 25/2. Checking children, we know the slope of the tangent to y2 = ax will be a/2y which is (75/4) divided by (25).... but that is 3/4, and of we know that the tangent is perpendicular to the radius going from (0,0) to (-3, 4) which agrees with m=3/4 . The real challenge now, if you are up to it, ....Assume the circle has a radius of r (pick your favorite value), and the parabola is y2 = ax (pick your favorite a) and now, find the equation of the tangent line, and the points on each where the tangent point falls. For example, if you used y=x2 at the point (2,4) the tangent would have an equation of y-4 = 4(x-2) and when x= 0, the y-intercept is at (0,-4). If instead you pick y= 3x2, when x=2, y= 12. The equation of the tangent will by y-12 = 12(x-2) and the y-intercept will be at (0,-12), the x-intercept at (1,0)in both cases. Now Can You See the Solution??? A short while ago I pointed out that kids could "see" the complex solutions of a quadratic in a relationship with the vertex and the leading coefficient. You can make that visualization a little more evident with a couple of graphs. The graph shown is y= (x-2)2 - 16 = x2-4x -12. One of the things I try to get them to see is that if you break the quadratic formula into two parts, it will give you a better sense of what is happening. In the example above the quadratic formula gives but I want them to see that if they break it into two fractions, the first part gives the axis of symmetry, 2, and the second gives the distance from the axis to the two real solutions, 4. 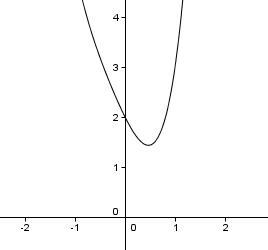 If you make the a coefficient larger, the curve will get to the x-axis sooner, and the two solutions will not be as far apart. The next image shows a quadratic with the same vertex, (2,-16) with a leading coefficient of two. The solution then, will cross the x-axis at a distance from the axis of symmetry which is now the square root of 8 (16/2) instead of the square root of 16. As a quadratic moves c units to either side of the axis of symmetry, the quadratic will change its y-value by an amount equal to Ac<2. Setting this equal to 16 (the distance of the vertex below the x-axis) we find the distance from the axis of symmetry to the roots. 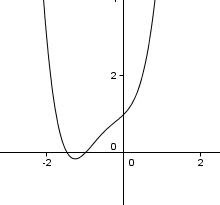 The next graph shows a graph of a quadratic with the vertex at (2,16) and a leading coefficient of positive one, which has no real roots. But if we graph the quadratic with the same vertex and a leading coefficient of the opposite sign, it will cross the x-axis at a distance away from the axis of symmetry that is the imaginary coefficient of the complex solutions. AND... If you rotate the entire coordinate plane by 90o, the two points will also be the endpoints of the Argand diagram of the two solutions. I'm hoping that if a kid can fit all this together, they will begin to understand quadratic equations, their graphs, and solutions a little more. If not, we can try solving them by Newton's approach with log scales... but more about that some other blog. I would like it to somehow relate to the number itself, but I have used up all the ones I know.. SOOOOOooooo dear reader, have you any suggestions? Something profound. Something fitting for the moment of "chilioi-ness" (the root which gave us kilo, except the ending, I made that part up). The world awaits.... History may yet hold a place for you as the one who first suggested this momentus term... Full credit in print, my gratitude, (and almost certainly a pot-load of temporary fame) will be yours. Ok, I'm as old as dirt, and I never heard of congruent numbers, which is bad since they sort of go back to the Dark Ages, and Fibonacci wrote about them, and Fermat DID have room in the margin for a proof about them... but a recent blog at at Bit-Player about it after a recent news release from AIM (American Institute of Mathematics) announced that all the congruent numbers up to 1 trillion have been enumerated. Well, job done I guess. The blog is so well written that I am not about to try to replicate all that good work, go read it. If you want more, here is a link from the AIM on the same topic. Enjoy, I certainly did. I came across an interesting problem on a video from Shai Simonson about Discrete Math. The question was to count all the possible permutations of a subset drawn from n items. But what do you do with P(n)= n P(n-1)+1. It doesn't seem to have a close form expression that lets you calculate the nth term directly. Once more Simonson gets creative. He points out that the derangements of n follow a similar recursive sequence, except that d(n)= n [d(n-1)] + (-1)n .
He then suggests that P(n) could be written as n! (1/1 + 1/1+ 1/2! + 1/3! + 1/4!... 1/n!) which matches the values of all the P(n) I checked, and of course, as n goes to infinity, that is just P(n)= n! e .
Ok, pretty interesting, and in fact, it seems that in all the cases I have tried, the actual value of P(n) is just Int(n! e) . It even works at P(1), and gets closer as n increases. I just thought it was a very pretty math. The comparison to d(n) leading to a really clever limiting value... nice job Sir. Can You SEE the solution? It may have been G. H. Hardy who first stated that mathematics is about finding patterns. In his autobiography he writes, "A mathematician, like a painter or a poet, is a maker of patterns. If his patterns are more permanent than theirs, it is because they are made with ideas." It is an idea I often repeat to my students, and to myself when I am trying to present new ideas to them. We are at that point in the year where we are working with the Fundamental Theorem of Algebra. 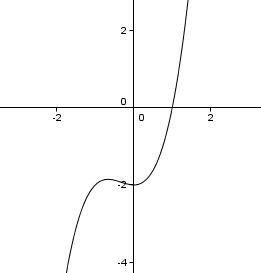 We have gotten to the point that most of the students can graph an equation, y=f(x) and looking at the graph write the factored form if the roots are all rational. In the vernacular of the kids, the can see the roots. As we began working with complex numbers, one student lamented that they wished you could see the roots as well on a quadratic with non-real solutions. Several others murmured agreement, and it seemed like a teachable moment, so I turned and said, cryptically I hope, "Well, you can, but you have to recognize the pattern." It is hard to believe they thought that there was something simpler than the quadratic formula, but they are more willing to do ten minutes work with a calculator than two minutes with a pencil, and besides, it is pretty, so I was willing to lead them toward it. I began by setting up some simple problems. graph the equation and find the vertex, then solve by the quadratic formula (never tell them they are actually practicing, we are discovering exciting, not in the book, kind of stuff here). 2x2 -4x + 20 (no one notices, it seems, that this is twice the first problem we had done) ... they sketch the graph, trace to x=1 to find the vertex at (1, 18) and hands fly up, eager lips whisper to each other, 3 +/- i sqrt(18), and nods in return assure them they are right... so the teacher springs his trap... pointing, a student responds with certainty... and the teacher tilts his head, and gives him "the eye".... "Did you check?" A timid young lady offers, "I got an answer of 1 +/- 3i." Heads lean toward each other. What happened. I was sure we had it... and then, an offering of insight... "It's half as much, I mean, its the square root of half of the y part...because of the two in front." But it is almost a question. The bell rings, and no one moves... "Is that it? Tell us." He turns to the board to hide his smile as he erases.... painfully slowly in their mind..then turns back.... and shrugs... then offers... "Hey, have a great weekend." Soul Cakes, Halloween Began in Britain?? Well, you get old and eventually you learn stuff. It seems Halloween came from the British, and is related to that old "soul cake" thing you heard (my beautiful bride swears she never heard this) as a child. I just saw a BBC show this morning and Sting has released it, don't ask why, some things must be left unexplained. "A Soul cake is a small round cake which is traditionally made for All Souls' Day to celebrate the dead. 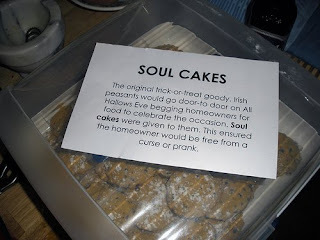 The cakes, often simply referred to as souls, were given out to soulers (mainly consisting of children and the poor) who would go from door to door on Hallowmas (new word to me, obviously the eve of All Souls Day) singing and saying prayers for the dead. Each cake eaten would represent a soul being freed from Purgatory. The practice of giving and eating soul cakes is often seen as the origin of modern Trick or Treating." "The tradition of giving Soul Cakes originated in Britain during the Middle Ages, although similar practices for the souls of the dead were found as far south as Italy." An apple, a pear, a plum, or a cherry, anything good thing to make us all merry. One for Peter, one for Paul, & three for Him who made us all. ...lyrics from A Soalin', a holiday song written and performed by Peter, Paul and Mary (1963)."